Bootable: Your PC can boot directly from this enclosure for any purpose such as switching OS. But the BIOS of your PC has to support the boot sequence function required. 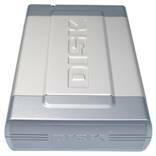 Dimension: 10.25" x 6.4" x 2.25"
Support IDE CD-ROM, CD-R, CD-RW, DVD-RAM, DVD-R, DVD-RW, DVD+R, DVD+RW and most types of IDE 3.5" hard drive and 5.25" devices. IEEE 1394 Up to 400mb/sec. Plug and Play hot swappable. Aluminum housing with cooling fans.